Welcome to Free Motion Mavericks (week 226). This piece is due in less than a month. 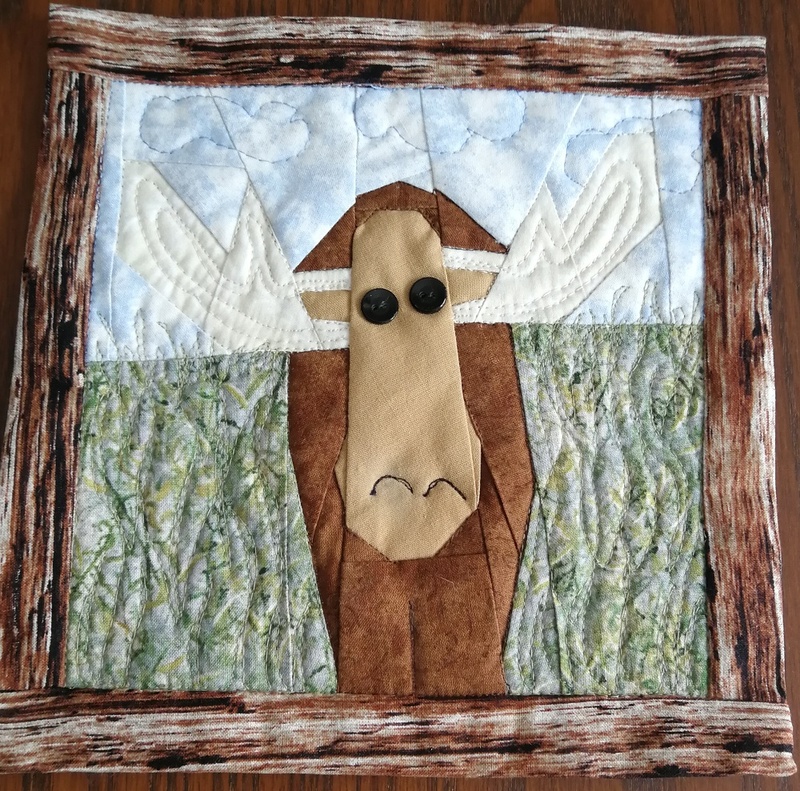 It will be part of an Out of the Box Fibre Artists exhibition, Summer Fibrations, at the Mississippi Mills Textile Museum this summer. On the weekend I was auditioning fabrics. The main fabric that I'm using is Gradients by Moda. It's just absolutely beautiful. 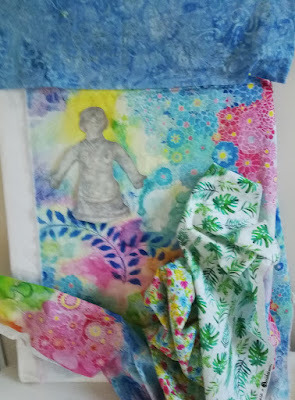 On Tuesday I went through my stash to find other fabrics that I will be fussy cutting from. As I was playing with them this morning, I realised that I will have to keep going through my stash for more. This is just the beginning but I think that the layout will probably stay. I'm sure that the flowers and details will get revised many times. As I mentioned in my last post, I took the week off and will spend most of it working on this baby. Unfortunately it hasn't been as peaceful as I would have liked. 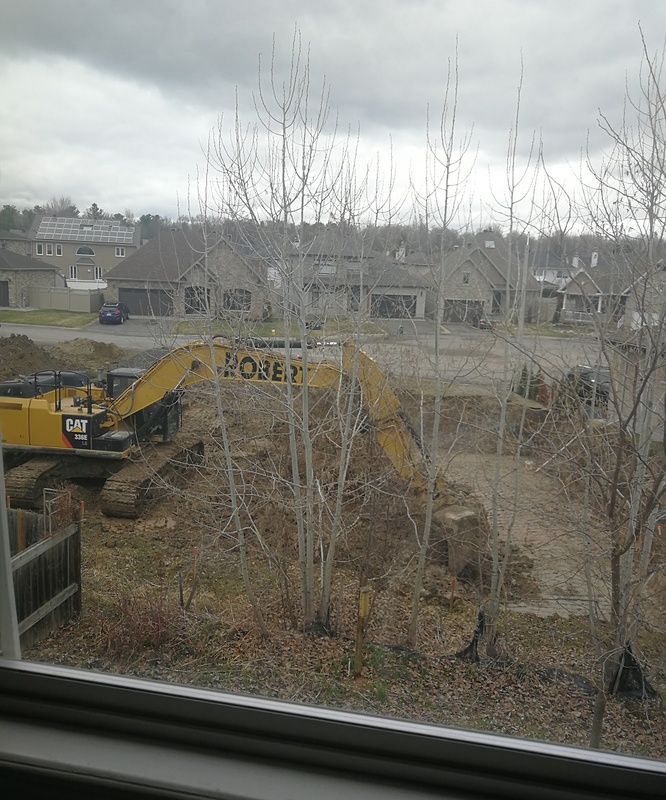 Below is the view from my window, which is why I'm working on the ironing board instead of my desk. 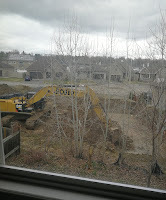 I think that the bulldozing is finished so at least the ground should stop shaking! If you want to read more about this project, see the Related links below. That's also where you'll find "What I learned" so far on this project. Thank you to everyone who linked up two weeks ago. As always there was some lovely projects linked up. 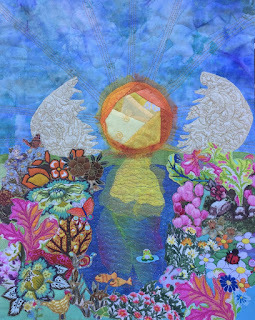 This week's highlight is Gretchen's Wiggly Whimsy Quilt with its 'organic wavy line' quilting. Don't you love her glamour shot? If you didn't see it, check it out. 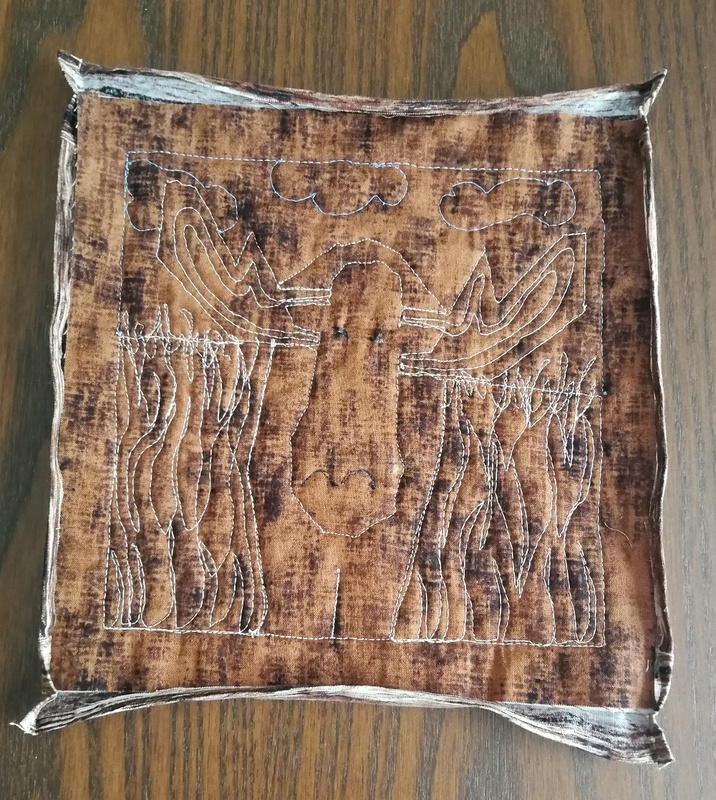 I was in the mood to do some free motion quilting but nothing serious, so I doodled for a while and then took out a practice sandwich. 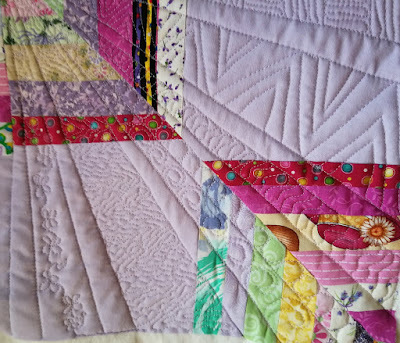 Last week I received a book from a fellow quilter who is cleaning her bookshelf. Isn't that the greatest thing? 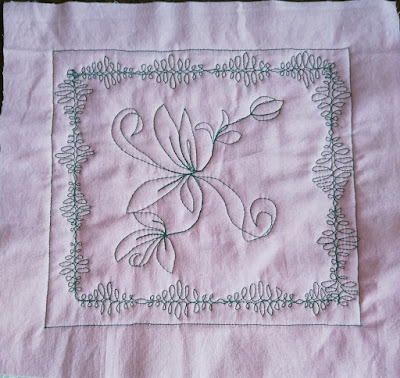 In a FMQ book, there were a couple of designs that I hadn't seen before, so I practiced these, put them in my FMQ journal and now I'm ready to pass the book along. Here is the result of that practice sandwich. 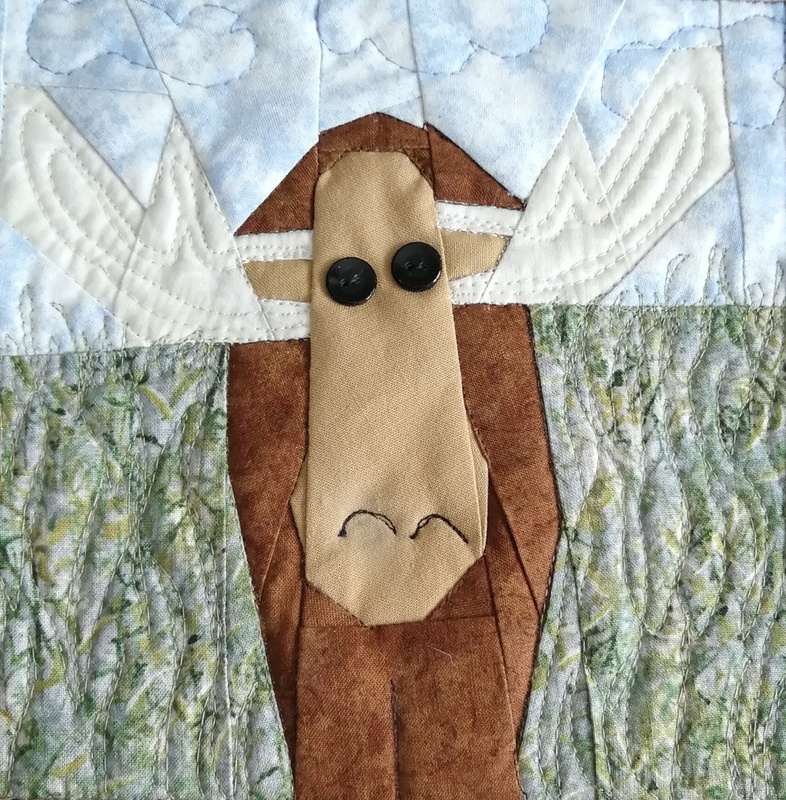 I have a final quilt to make for this summer's fibre art exhibition at the Mississippi Mills Textile Museum. I have till May 20th, so it's really time to get to it! 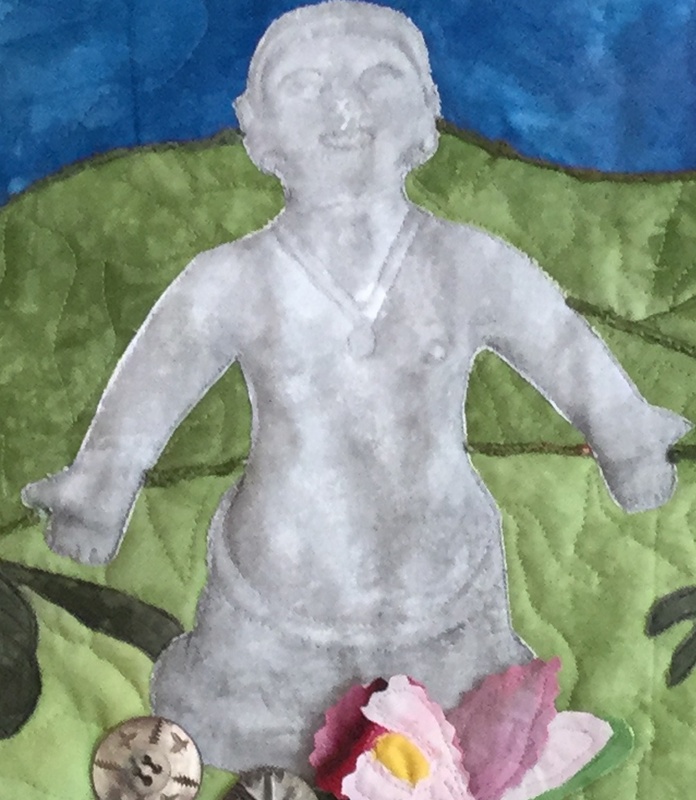 For this piece, I am using the same image that I used a couple of years ago for my Art With Fabric piece, Gaïa, Mother Earth. 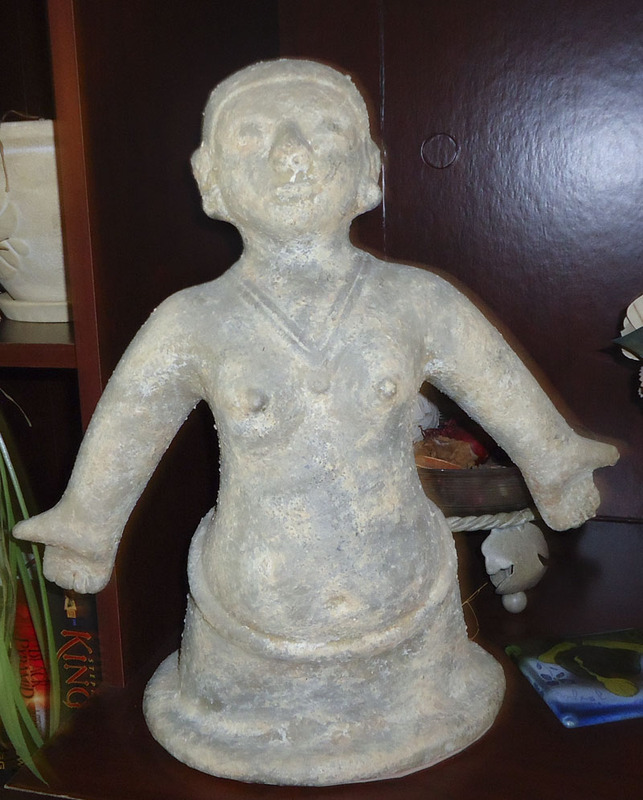 The image is of a reproduction statuette of a beautiful Pre-Columbian female figure from Colombia, South America. This is the image that I originally created with the help of photo transfer medium. This time, the Goddess will be located in a lush garden. I found some amazing fabric that is all soft colours. I'm going to fussy cut it as well as tons of other fabrics to create a colourful Earth for Gaïa. I would like it to have the same feeling as my Morning Has Broken piece. For the free motion quilting, I really need to keep practicing those cursive "l" and "e" shapes. I really like the look of them as they go from small to large and then back again. For my piece, I don't want to reproduce Morning Has Broken, but I really love the look and feeling of it. I hope that I'll be able to translate that into something new. Looking at the picture of Gaïa with the auditioned fabrics, I realise that I will have to make sure that she is not lost among all that colour. I will be on holidays next week - so my goal is to fussy cut the fabrics and finish the design. Have a great long weekend and Happy Easter! Why would I want to add this to my plate? Well, it's on Instagram, so it takes about 2 minutes to post, which is a plus. Also, even if I'm wiped, it would be nice to do something that is productive but simple and stress free. My answer to that is to follow #the100dayproject and at the very least do 10 minutes of hand-stitching (embroidery or English paper piecing, etc) a day. It's a goal and no one will care if I do it or not - but it would be nice! While I was practicing the herringbone stitch and playing with hexies, I created a fabric page dedicated to the Herringbone stitch. 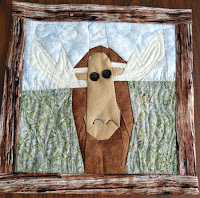 I got the idea from Janine at Rainbow Hare, who is also participating in the Take A Stitch Tuesday (TAST). 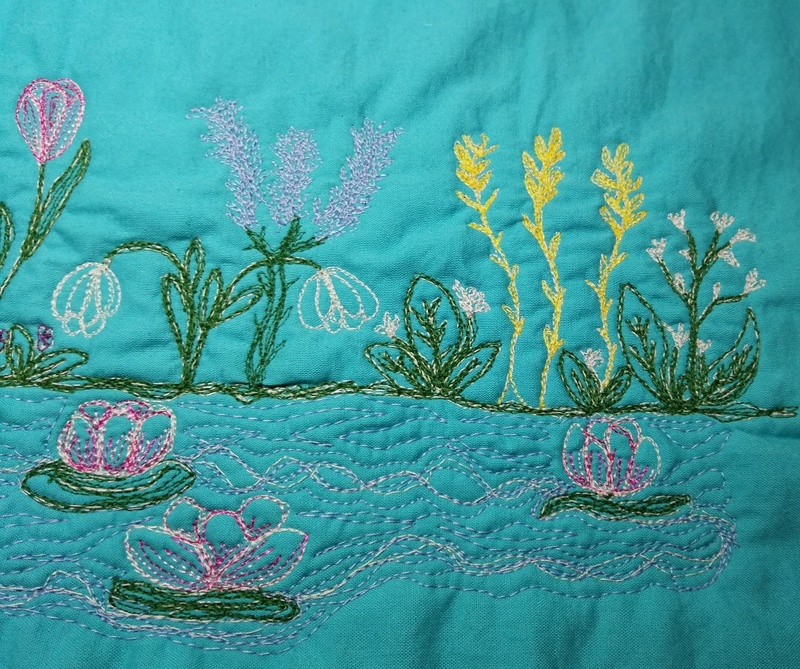 I get bored easily and love the embroidery work that she is doing. 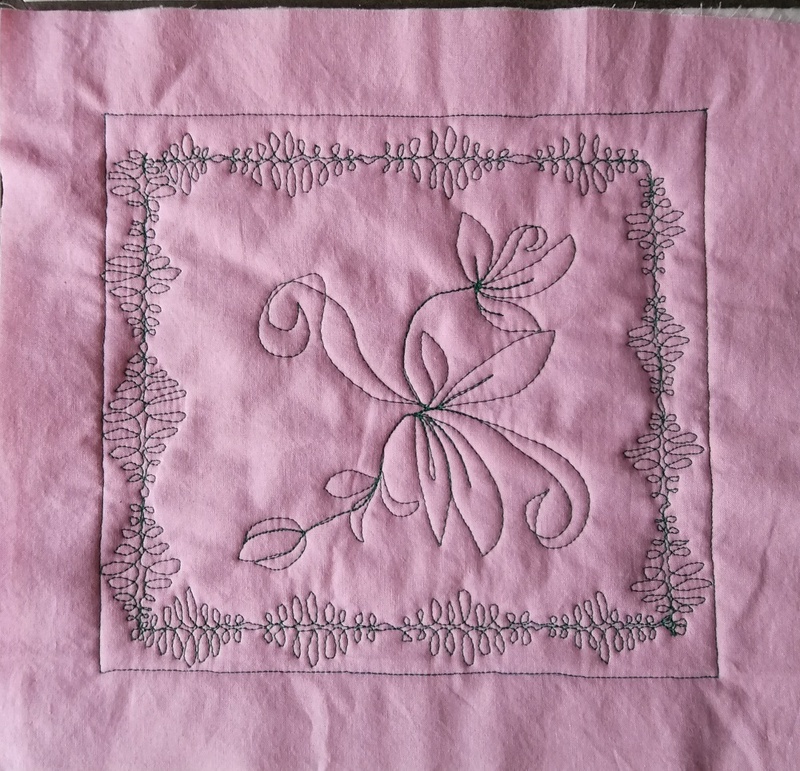 One of her ideas is to create a page of the different stitches. You can check it out in the Related links below. This is my Herringbone page so far. 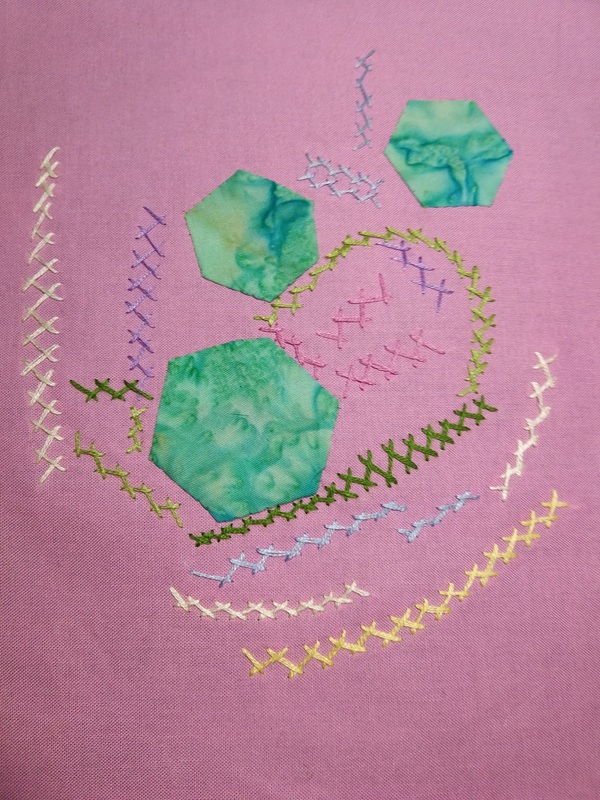 I've been experimenting with the size and angles of the stitches, and of course the more colour the better. 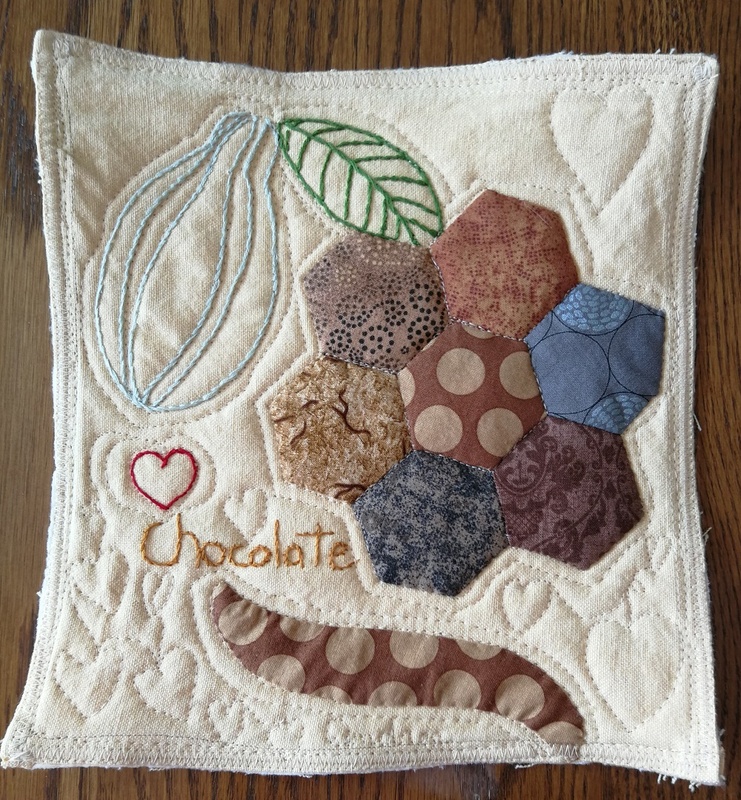 And, just for something different, I added hexies to the mix. 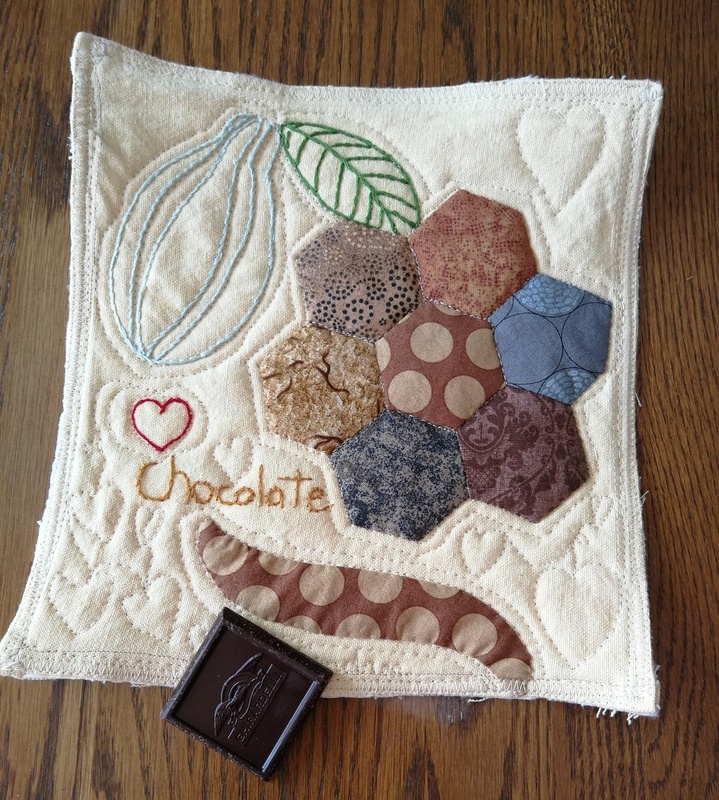 I'm starting to think that everything is better with hexies (and chocolate)! 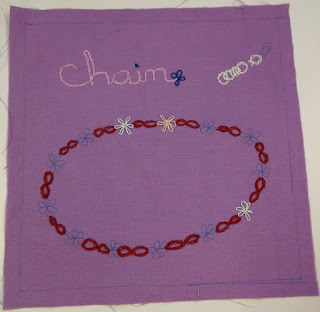 I started the chain stitch page a while back. This week, I did a little bit of embroidery in the car on my way to work. It was a really great way to start the day. I'm going to try to keep that up! I've also working on the final hexie flowers for my Kingfisher Stitch Along. The Stitch Along started last May and finished in July, so I'm not a year late....yet. Hopefully the sewing of the diamonds will go well. My objective is to finish it by the end of July, so that it's only one year late! I need a variety of small projects to keep me going. If I have a few easy ones started, I'm more likely to pick one up in the evening. That's the theory anyways. I'm still following TAST but getting pretty far behind. 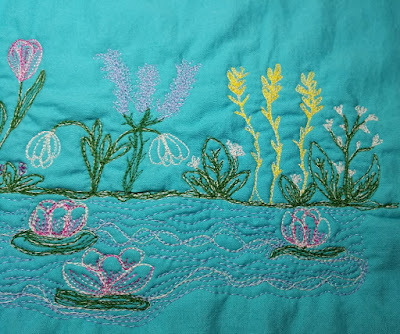 When I feel ambitious I can work on new embroidery stitches, and when I'm not, I'll just do more chain stitch or practice other stitches that I'm getting better at. 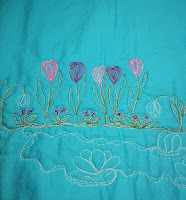 I also want to experiment with the size of the stitches as well as the size of the embroidery thread and perle cotton I use. 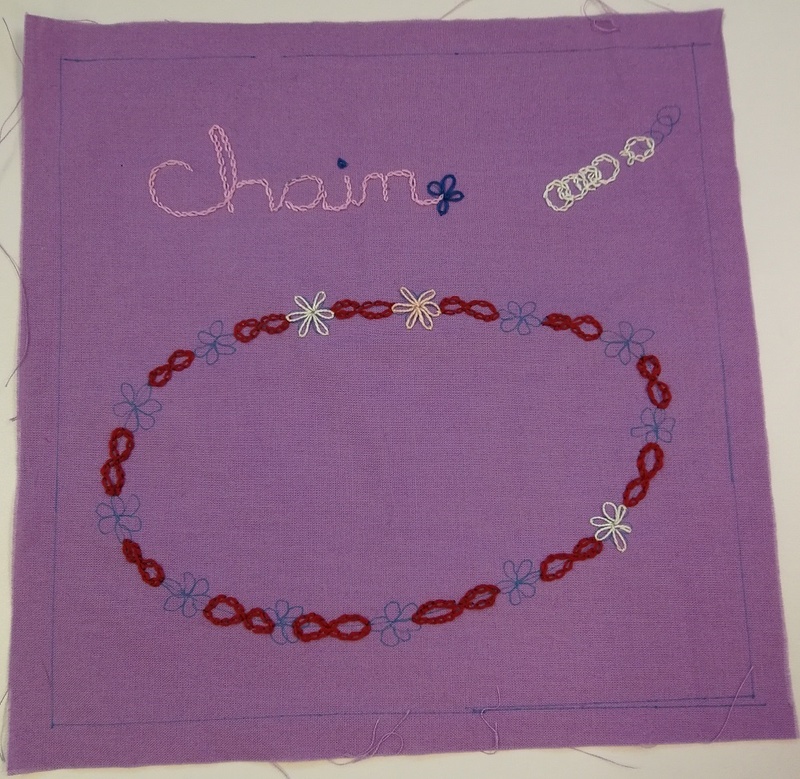 I have a colleague at work who is learning to embroider - so next week we are going to embroider during our lunch. Welcome to Free Motion Mavericks (week 224) link-up. A month ago, I foolishly thought that spring had finally arrived in Ottawa. During yesterday's small snow storm, I heard some not-so-funny guy mention that we had spring two weeks ago and that next week would be summer. That's not very funny because it's happened before. Since my favourite seasons are spring and fall, this would not be good news. So, spring or not, I decided to add some colour to the free motion quilting (FMQ) that I created to celebrate the coming of spring. Although this image is not great, you can click on it for a better look. I had started FMQ with grey thread but originally I was going to use a variety of coloured thread. 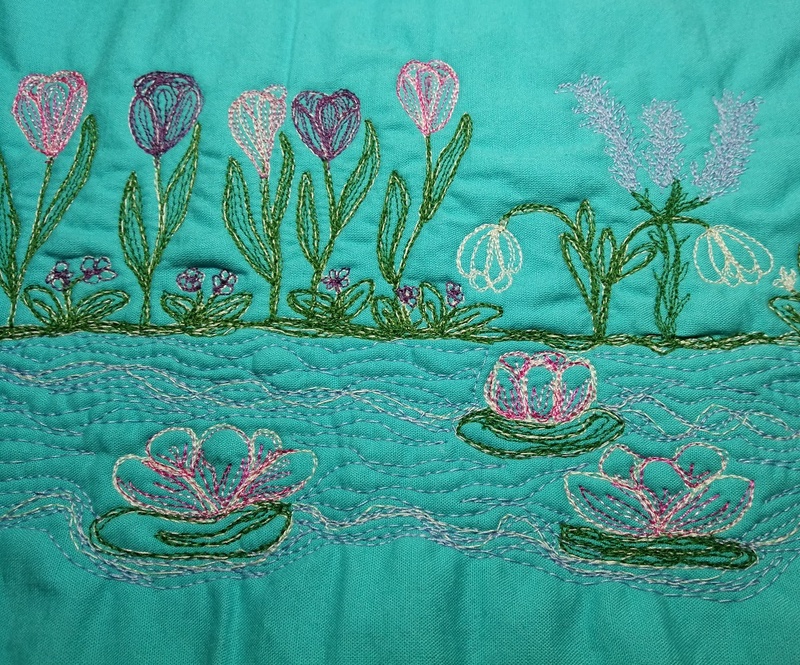 Since the piece was very dull, I wondered if I could add different colours over the grey thread to create some interest. At first, going over the grey just added colour over the grey. It was not impressive. You can see the results in the image. 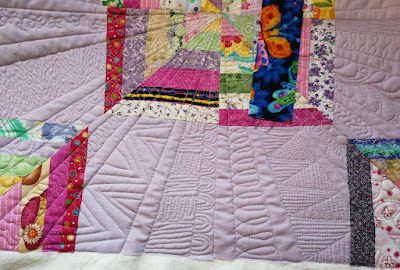 Since it looked better in the flowers that were densely quilted, I just kept on FMQ. After going over the grey many, many times, it started to look pretty good. Even the pond gets a make-over. The finished grey piece was a good practice piece but nothing else. 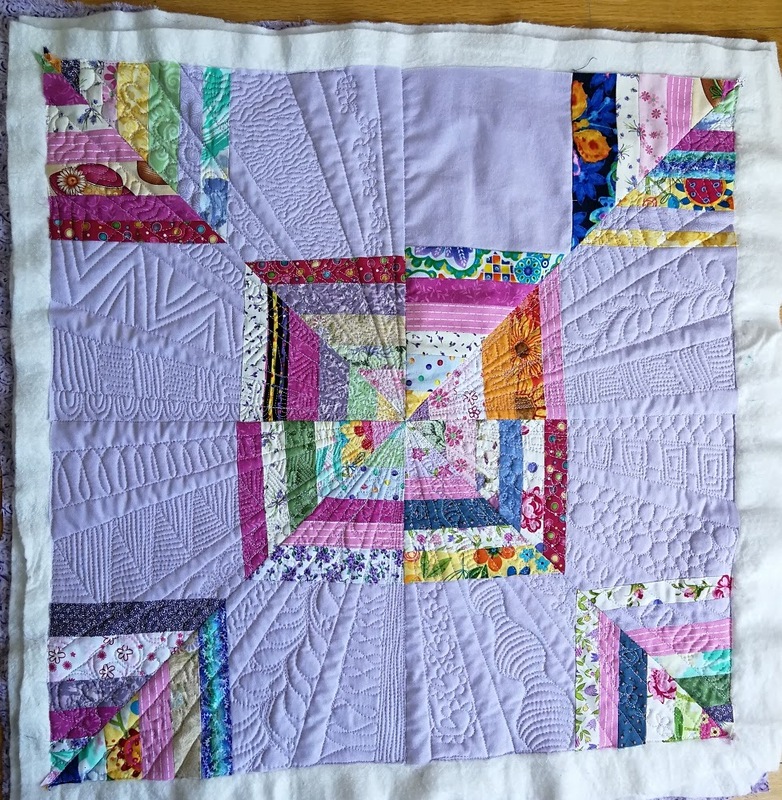 Adding colour to it now gives it some potential to be a fun mini quilt. 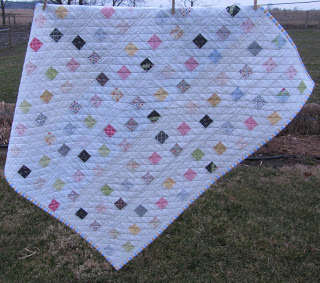 FMQ over something that is already quilted is different than FMQ on a blank fabric. 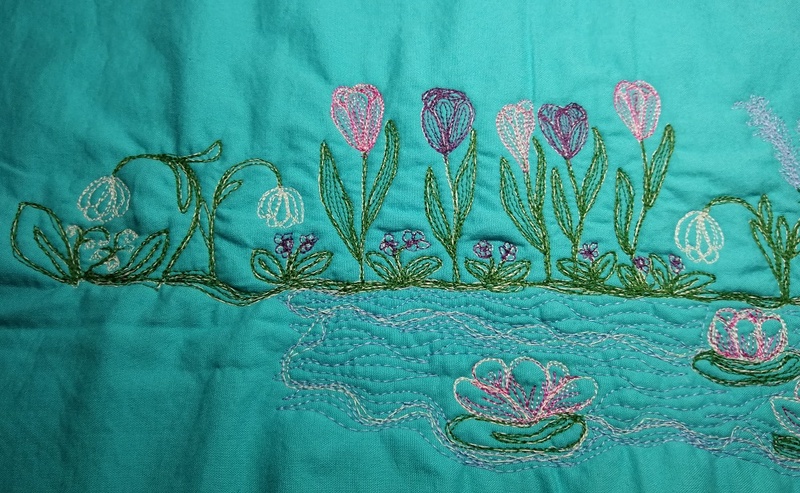 Because I had to follow the original stitching, I ended up FMQ the flowers from the top down so that I could see what I was doing. 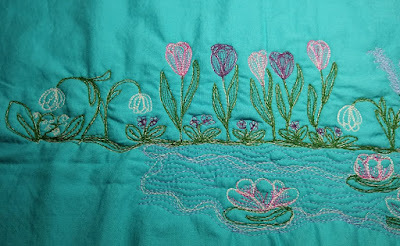 Did you notice the blue flowers that I added behind the snow drops? 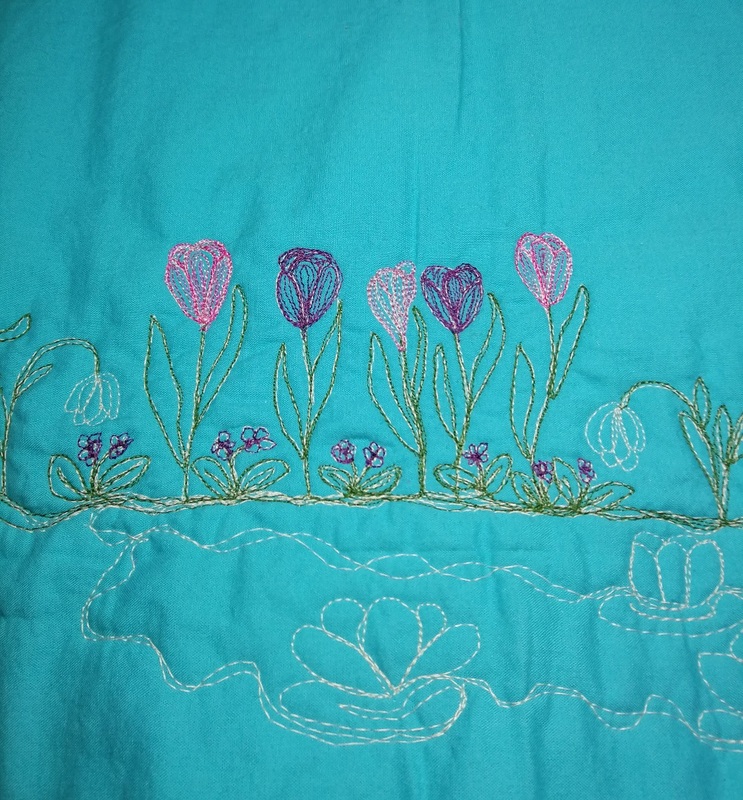 I did go over the FMQ a few times to make the stitching denser but they are pretty dull compared to the other flowers around them. 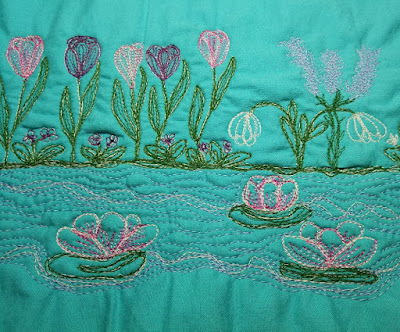 In the original piece, I was pretty disappointed with the lotus flowers in the pond. 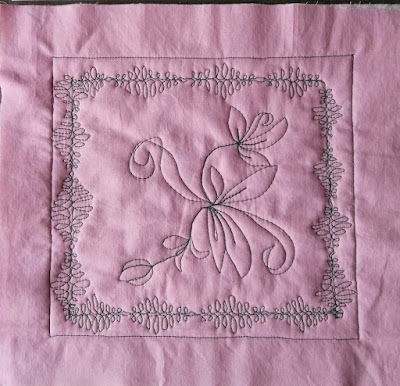 After adding some variegated pink thread, I really like them. I was even able to change the original shape of a couple of them. 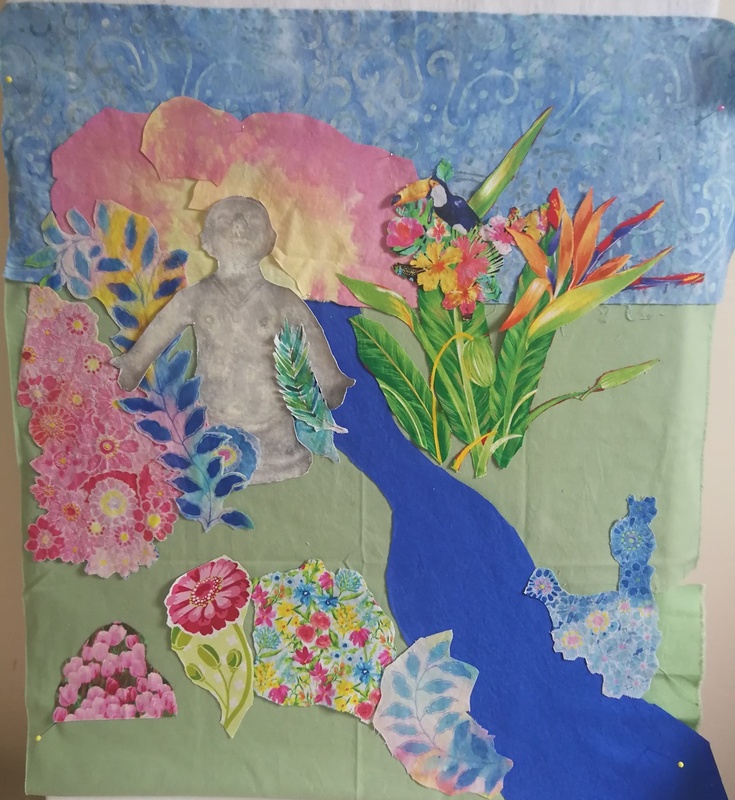 I think that the water in the pond adds a lot to the piece. Now I need to find a frog! Wonderful news! This post was featured on Midweek Makers. Thanks so much Susan! Thank you to everyone who linked up two weeks ago. 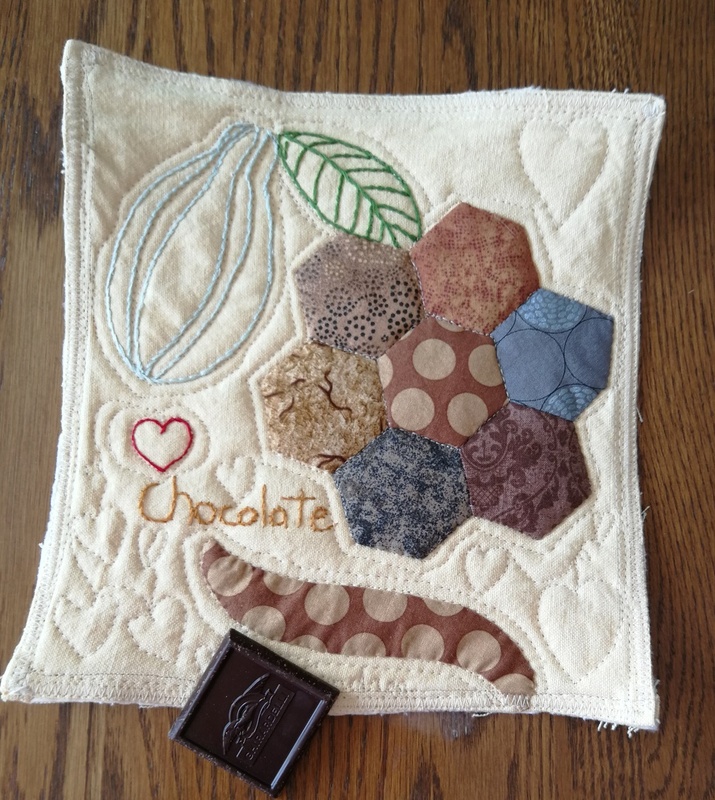 The FMQ was wonderful and it was really difficult to choose only one project to highlight. 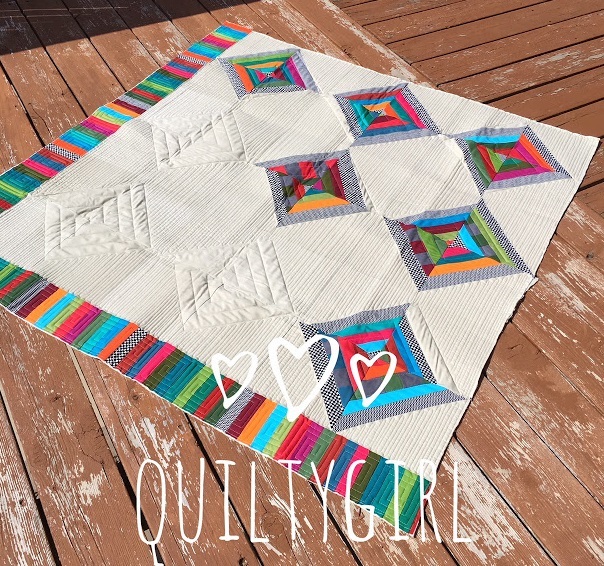 If you didn't see it, you really should check out Alycia's string quilt with its matchstick quilting and Greek keys in the border! If you keep forgetting to link up, you can always follow this blog by email. Then you will see when the Free Motion Mavericks link up is on. You can also do the same at Muv's blog, Lizzie Lenard Vintage Sewing. I've made a few foundation paper pieced minis using Made by Marney's patterns. This is the latest. 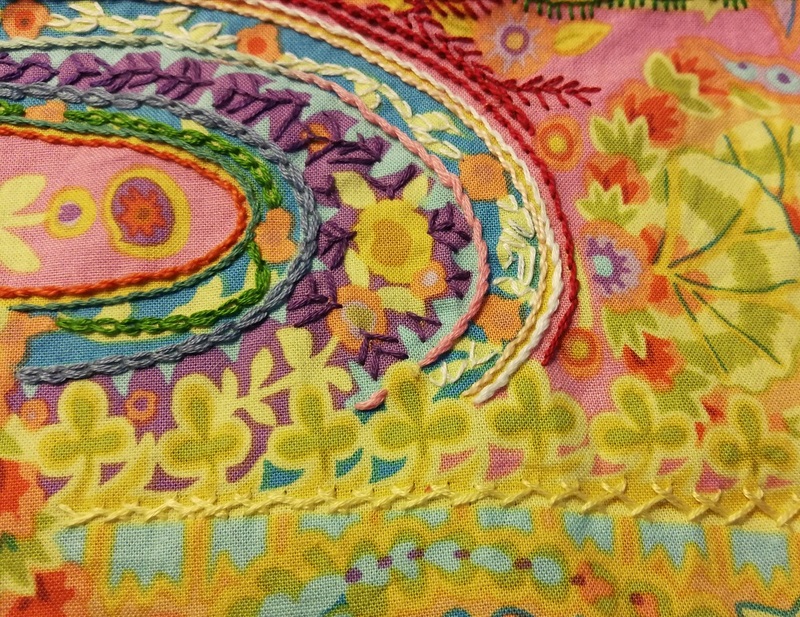 Since I added a border to the mini, I actually remembered to used the Extended-border binding technique. It really worked out well. 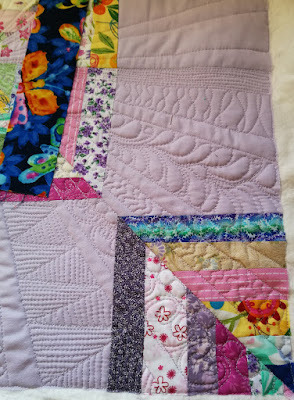 I stitched in the ditch around the border and then free motion quilted (FMQ) the mini, up to the border. 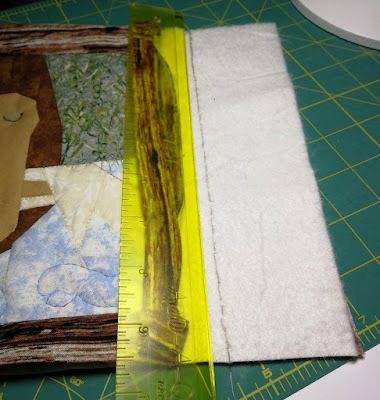 I then flipped the border towards the mini and cut the batting and backing about one inch from the sewn edge of the border. I had ironed the binding so that I knew where to trim the batting and backing. At the bottom of the image below, you can see that the batting reaches to the border (if it's laid flat). Once the batting and backing were trimmed, I flipped the mini over and hand-stitched the border to the back, as if it was a binding. For more details see the link to the tutorial in the Related links below. 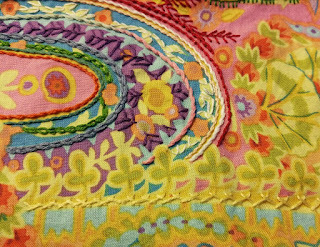 The border will cover the back, as if it was a binding. Here is the mini from the back. 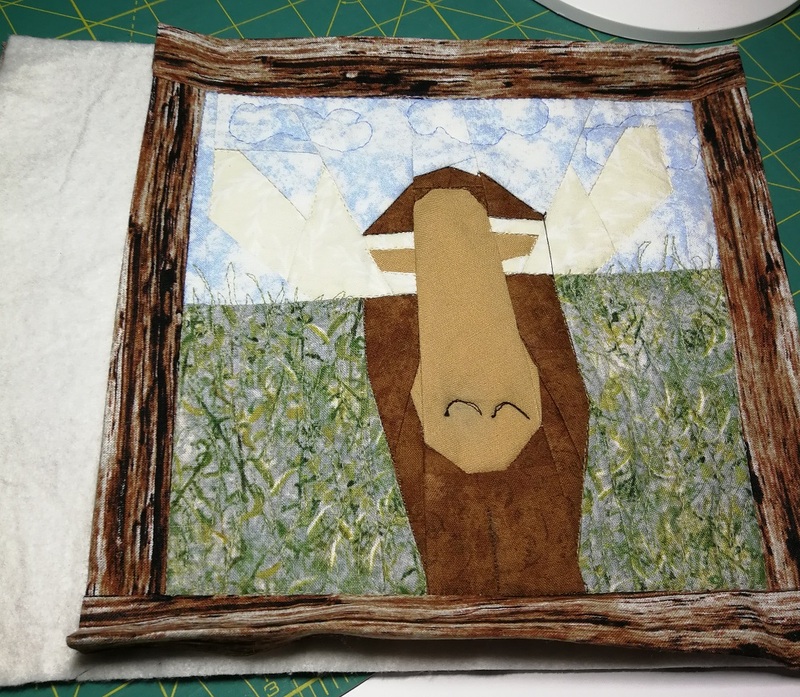 The backing and batting have been cut and it's now time to fold the borders over them. I used a different fabric for the bottom of the mini since I wanted it to look like vegetation. 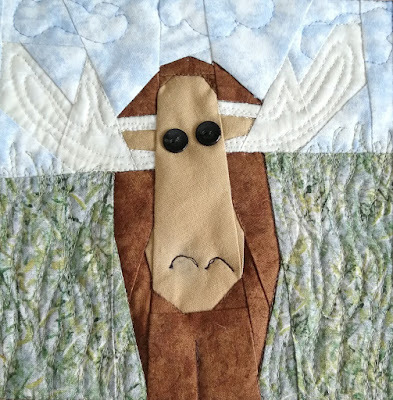 Next time, I think that I'll just add an extra piece between the sky and the bottom so that the vegetation doesn't go all the way up to the antlers. 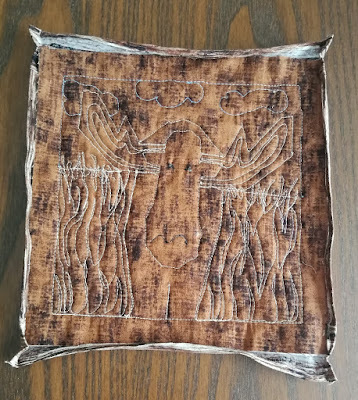 After trimming the batting and backing, I realised that the moose's antlers were not very visible, so I added some FMQ. Preparing the extended-border was much easier this time than the last. 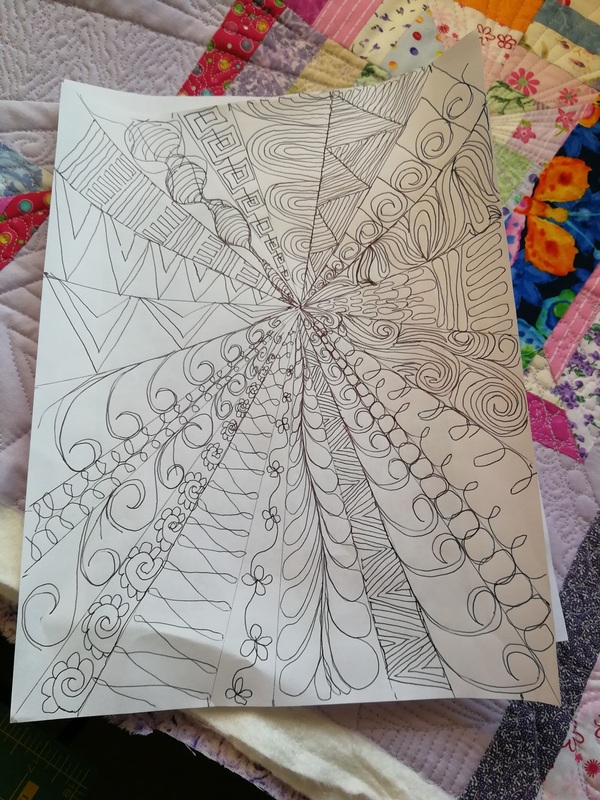 I used a quilting marking pencil that turned out to not be erasable! I got rid of it, but not before making a mark that won't go away! I could have made it on time for the March OMG (barely) except that I didn't have two small matching buttons in all of my button stash! Welcome to the All About Strings Blog Hop and the Free Motion Mavericks (Week 222) link-up. 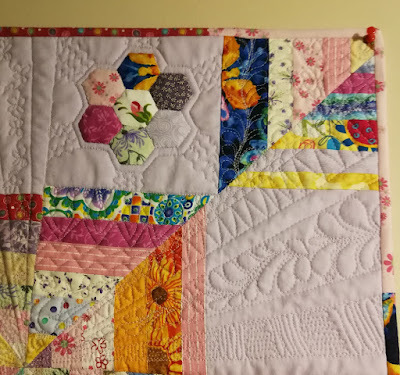 I challenged myself to make this string quilt into an art quilt. Here is the journey and result. I thought that I was making a spiderweb string quilt but the instructions I found on the Internet were not correct and by the time I figured it out, I decided to just keep going. "Tries to play nice with others"
The background is a Kona cotton solid. I used two layers of cotton batting for the first time. 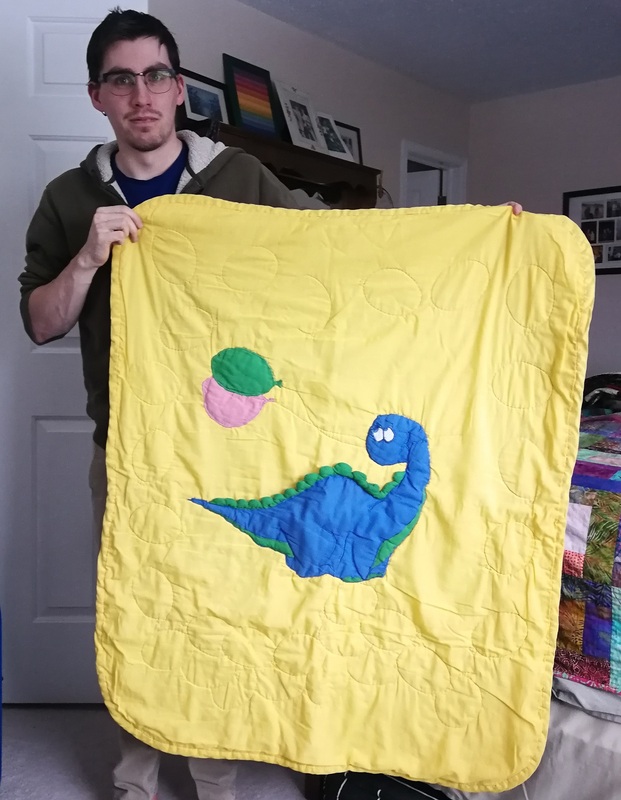 I really wanted the quilting to show and I figured that this was the perfect mini quilt to test it on. My favourite part of making this piece was the free motion quilting (FMQ). It was such a great opportunity to find designs and keep practicing. 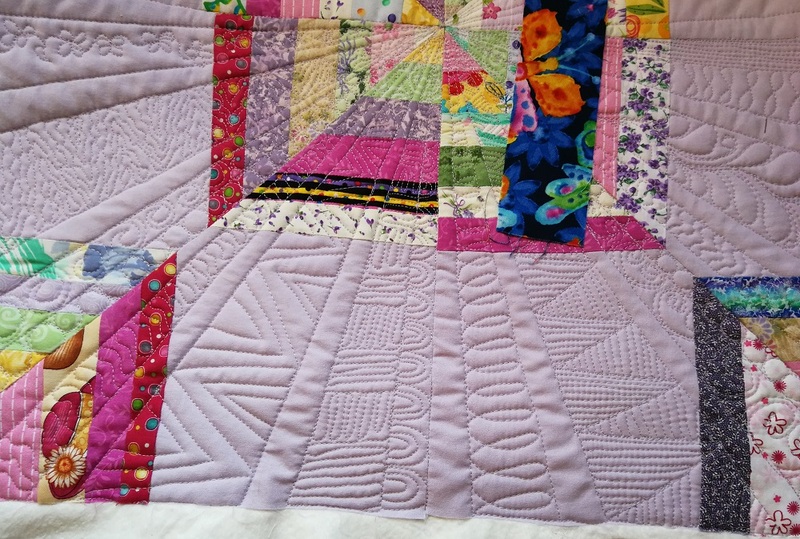 I separated each triangle into 7 sections, leaving a 1" section empty between each FMQ section (sort of). 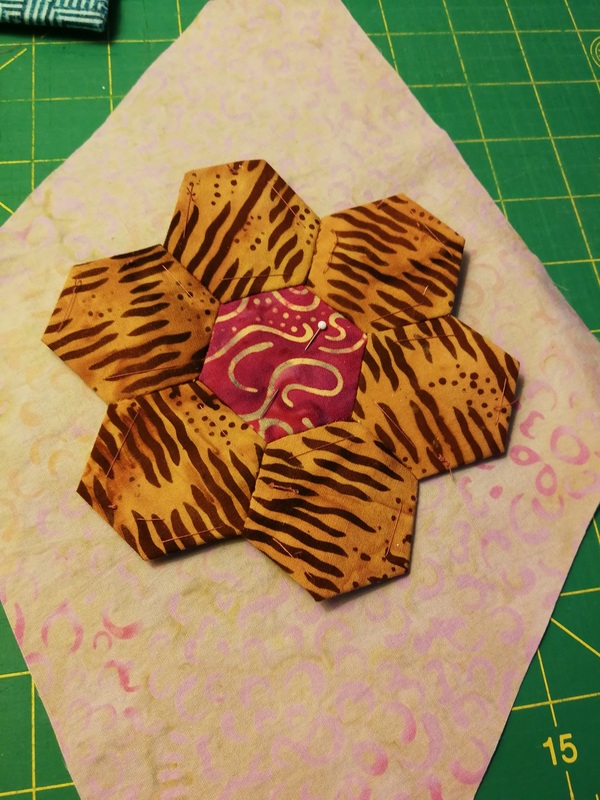 I searched my FMQ journal for ideas as well as a few of my go-to books. 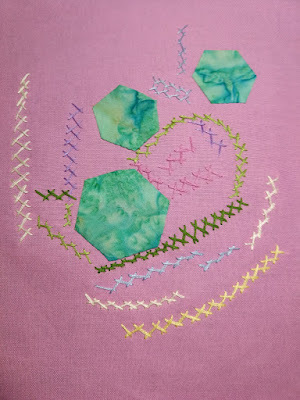 I then practiced some of the designs before starting to FMQ. Had to include some feathers! As I was quilting, I kept thinking of what to do for the "special block" that would illustrate "Tries to play nice with others". 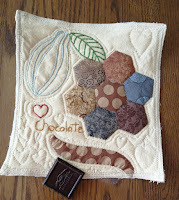 All is quilted except for the "special block"
In the last year, I've fallen in love with hexies. I try to incorporate them into my pieces in all kinds of fun ways. 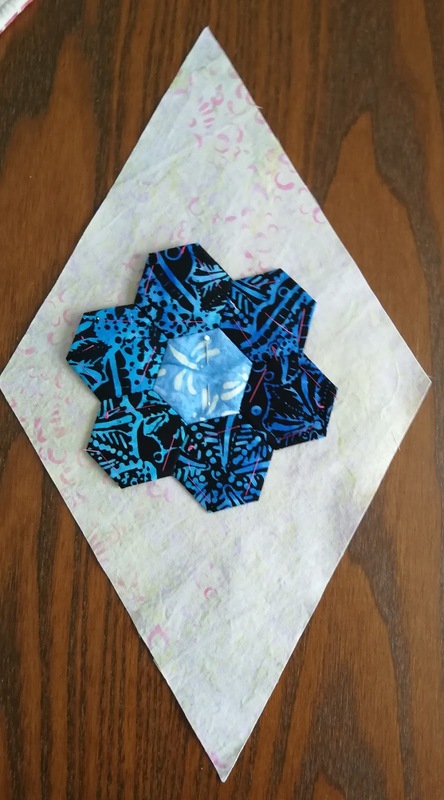 😊 The "special block" just had to include hexies! Adding hexies whenever I can! So, have you figured out why this piece is called "Tries to play nice with others"? It's about being the same, but different; about trying to fit in, without ever really being able to. It's also about celebrating what makes us unique or special! 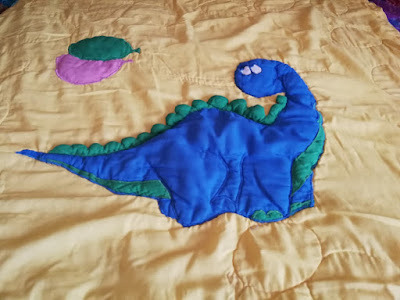 Not all quilting instructions one the web are correct! 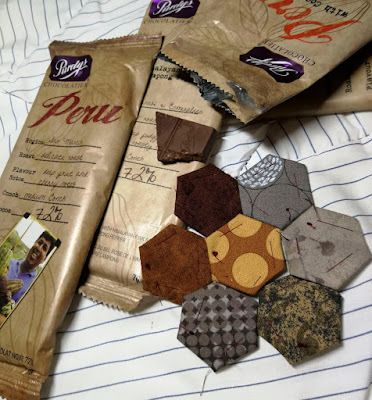 Turns out that a bunch of 45 degree angles make a square!!! It didn't take me long to decide to go with the flow and create with what I had. 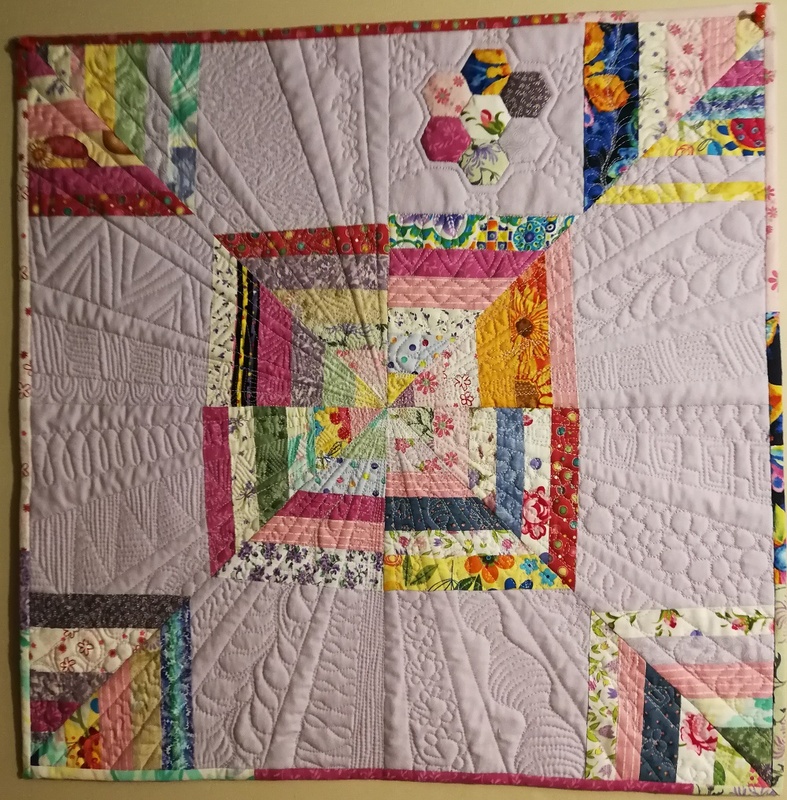 It was an piecing oops that determined the title and final look of the quilt. I just had to embrace the design opportunity! Quilting with 2 cotton batting was terrific. I will certainly do that again. Here is the link to the participants of the blog hop. I hope that you'll take the time to see the great work that everyone has done! Welcome to my week to host Free Motion Mavericks (week 222). I hope that as you read this post as part of the All About Strings blog hop, that you'll take the time to link-up your strings project! Thank you to everyone who linked up two weeks ago. A special thank you to Gail for linking up her gorgeous runner. Congrats on a great finish! If you didn't see it, you really should check it out! As I'm writing this, I'm frantically thinking of what I could finish for this challenge. I don't know if you remember but in the Instagram event, 100 hexies in 100 days, there was a week for "Something Sweet". 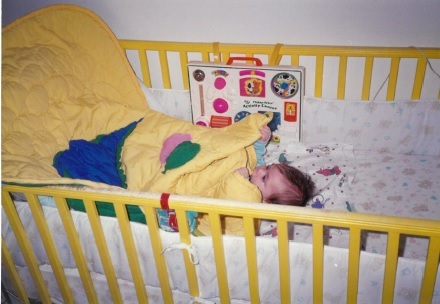 Here's the picture that I posted and what I wrote about it. 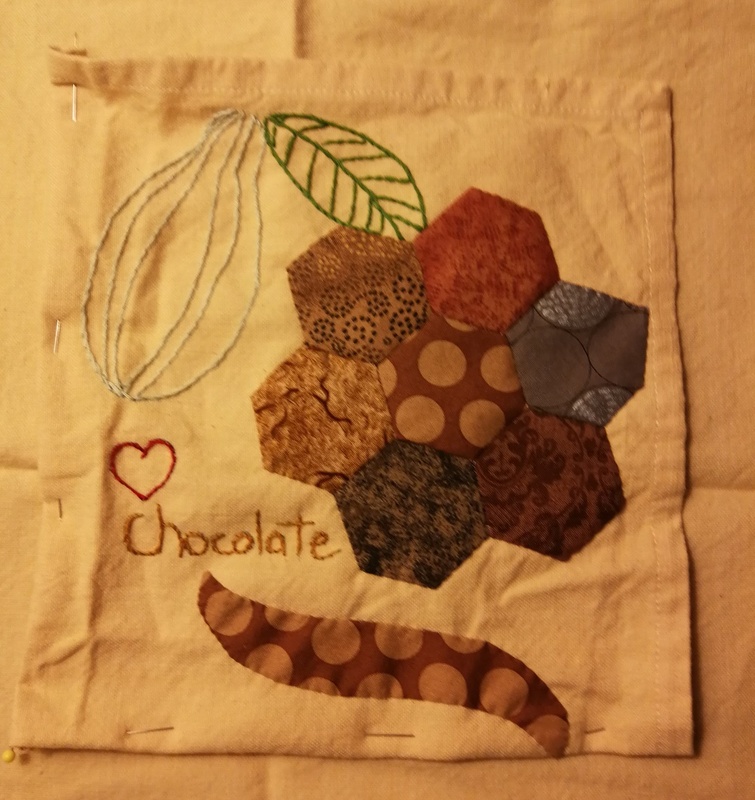 "It was the brown fabric with caramel coloured dots that gave me the idea for this. Doesn't it look good enough to eat?" At 2:30 am, I was quite happy with my results. 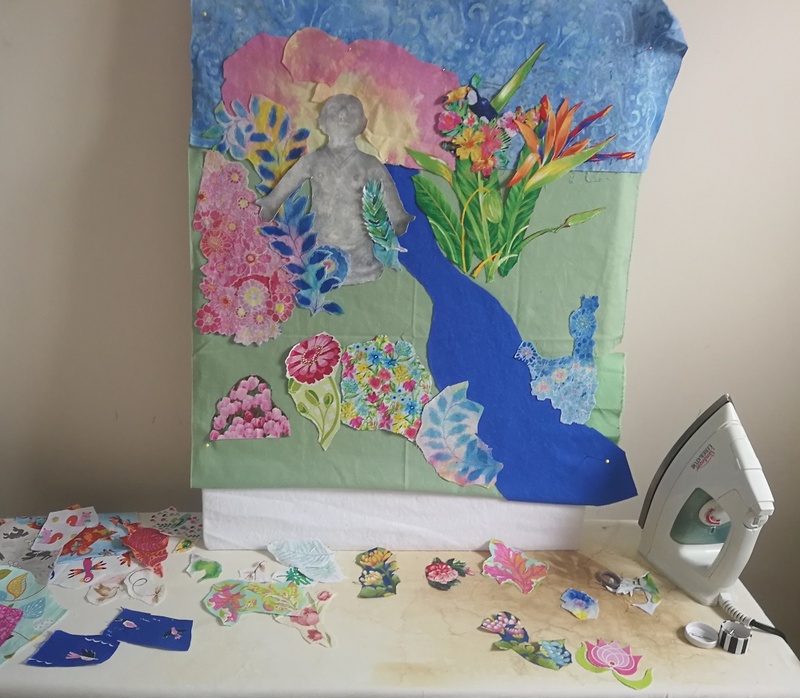 I had done everything that I could since my sewing machine is in the bedroom and hubby was asleep! It's not a pretty picture since my good light is next to my sewing machine. 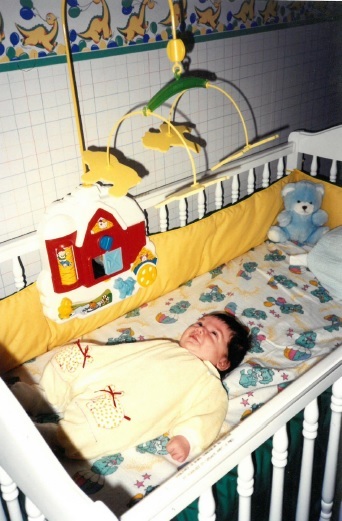 It was difficult to sleep last night because I was so excited.... so it was even harder to get up at 8:30 this morning. The proof is in the eating....it was great chocolate! This was too much fun. I know what I'm doing next January - participating in all of the Project Quilting challenges! I really, really need a coffee but it's amazing what I can do without coffee...when motivated! 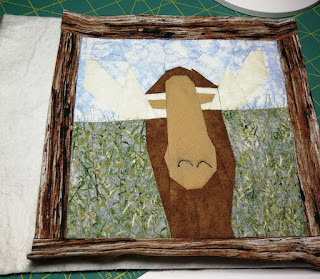 Thank you Sherry at Powered by Quilting for introducing me to Project Quilting! 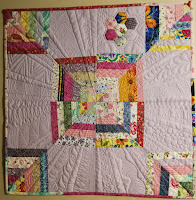 This post will be linked to the Project Quilting, Season 10, Challenge 6 link-up. I did it!!! I linked up to Sandra's DrEAMi! link because if this isn't a squirrel project, nothing is! Check out what everyone has made, and make sure to VOTE for your favourite. Size: 8 ½" x 9 ½"